Made of cast iron and 18/10 stainless steel with a rubberized handle. Additional attachment for juicing grapes, berries, tomatoes and other soft fruits. 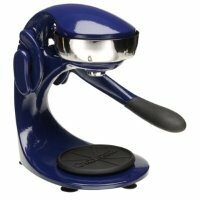 Manual juicer that quickly and easily presses juice from all citrus fruits. The strainer and basket are removable and dishwasher safe. Appliance Warranty 7 Years This juicer has a longer than average limited appliance warranty. Again, the warranty is a good indicator of overall durability. Star Rating 2.9 User reviews, ratings, and feedback indicates that this juicer is rated lower than average by 20 users and ranks in the bottom 10% of juicers.